Amy of “This Heart of Mine” is a wife, mother of two and a maker. Making is her thing whether it is food, DIYs or photos of her children. Follow Amy on Facebook, Instagram, Pinterest, Bloglovin and Twitter to keep up with the latest from this heart of mine. Amy is married with two lovely children. 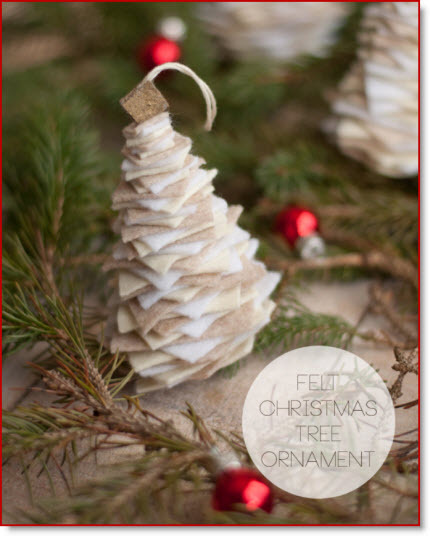 She made this totally darling “Felt Christmas Tree Ornament tutorial” for us to follow with pictures. Thanks Amy for sharing this tutorial. So cute! I’m Jewish, and I love this! 🙂 This might be a perfect teacher gift!